This is a quick primer by for Bangaloreans on borewells, open wells, recharging, and undergound acquifers. Bangalore originally used to rely on open wells more than borewells. Open wells get their water from shallow acquifers that lie at depths of less than 80 feet from the ground. 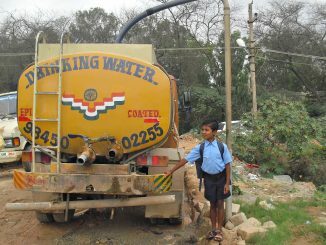 Many parts of Bangalore still have open wells. Illustration: Sripathy Konada, Biome Environmental Solutions. Click for larger picture. Borewells are in essence, narrow holes dug deep into the ground. A borewell taps into a deep acquifer, which essentially water in rocks. Because waters of shallow acquifers are subject to contamination (in part to due to industrialisation) people have been abandoning open wells, and moving to borewells. To understand how borewells tap ground water, one needs to understand the layers of the earth at the top. Below the top soil is the weathered zone, which is made of rock and behaves like a sponge. This layer changes from area to area. Then comes the bed rock layer. The bed rock is not a monolithic layer; the rocks have cracks and fissures through which water passes and gets accumulated inside the rock. This is a deep acquifer. Borewells break into the bed rock and taps into the water there. A water diviner’s services are often called for a borewell because the diviner locates a point where you dig a hole to reach a crack and fissure system on the bed rock, several hundred feet below. Recharging is process of letting water back into the earth. A recharge well is a big hole through which water goes into the sponge or weathered zone. Recharge wells are dry wells, in the sense that they send water down in one direction, and do not yield water (initially at least) themselves. Imagine a dry sponge and you are pouring water through a hole into the sponge. The water soaks up the sponge. Sooner or later, the sponge will hit a saturation point. At that point water appears back in the recharge well and it starts yielding. When this happens (all recharge wells have this potential) a recharge well becomes an open well. Over a much longer period of time, the sponge zone water goes into the bed rock, and in the process trickling down it gets purified. This is why borewell water tends to be purer. How do shallow acquifers form? There are cases where locally there will be a layer below the open well in the sponge where water from the recharge well does not go into the sponge itself. Instead it builds an underground lake and that becomes the shallow acquifer. The recharge well then starts yielding. Over a very long time, deep acquifers can get saturated too, and this can build a shallow acquifer above. Fill this survey and qualify for a lucky draw in which you could win four PVR Cinema tickets! You will also be helping map the cost of water in Bengaluru. Register your borewell now, if you haven’t already! You can also complain to the government if you are being approached by middlemen who demand excess money to get your borewell registered.